In a nutshell: Credit Karma encourages debt discussions with its latest #MyMoneyStory campaign, an initiative to break the taboo and bring debt to the forefront of your next conversation. Credit Karma believes talking about finances can be the first step toward overcoming debt, so it pioneered a unique way for consumers to share their financial journeys, in hopes that one person’s mistake can be a valuable lesson for many others. Credit Karma also provides free credit reports and scores, financial tools and recommendations to help its 45 million members understand and improve their credit. Debt isn’t something people talk about casually. For many struggling to pay their bills, it can be an embarrassing experience they choose to keep private… until it’s time to ask for help. In reality, debt is a far more common problem than many realize. The latest Pew Charitable Trusts report found 80 percent of Americans are in debt. Credit Karma wanted to change people’s shyness toward discussing money by launching “My Money Story”, a campaign to bring about more financial awareness and let people know they’re not alone in their money struggles. We spoke with Bethy Hardeman and Felicia Chen, of Credit Karma, to learn more about the campaign and how consumers can utilize the resources available on CreditKarma.com to turn their financial situations around. Felicia and Bethy agreed that talking about difficult financial topics is one of the first steps toward overcoming that taboo and getting on the path toward fixing your credit or any financial mistakes you might’ve made. “The whole idea behind ‘My Money Story’ is that we want people to share their financial journeys and experiences with us, whether that’s been a good journey or a bad journey. Maybe they’ve made mistakes in the past and they’re rebuilding their credit or their finances in general, and we want to hear all about it,” Felicia said. Here we highlight some of the stories people are sharing using the hashtag #MyMoneyStory on social media. These are real stories told by real people. We chose these three particular stories because credit card debt, student loans and unpaid bills are common issues most of us have faced at one point or another. Viridiana’s story is a classic narrative we’ve all heard before. When she was 18, like many teenagers, she got her first credit card and didn’t know how to budget. Many young adults who are new to being financially independent have similar stories, but luckily in Viridiana’s case, she was able to overcome her debt. After a year of repayments on her $1,500 debt that went into default, Viridiana was able to pay it off and close her account. To help rebuild her credit, she opened a secure credit card with a $500 limit. Jason’s story is one of student loan debt gone horribly wrong. Jason moved to Los Angeles to pursue his dream of becoming a 3D animator. In his pursuit, he racked up six figures in student loans and $25,000 in credit card debt due to the high cost of living in L.A. Unfortunately for Jason, supply in the animation industry far outweighed the demand, and he had no choice but to fall back on his software engineering degree. He was able to pay down his credit card debt and one private loan, but he defaulted on the rest. He’s hoping to pay down his federal student loans, rebuild his credit and open his own business in the future. Michael fell into the 35 percent of consumers who have never checked their credit reports, completely oblivious to the negative mark that was seriously hurting his credit score. Michael moved from Utah to Texas and had an outstanding bill to a gas company for $42. The gas company mailed the bill to the Utah address after he was long gone, and Michael never knew he still owed money. The resulting charge-off on his credit report, in addition to his high credit card utilization rate, sunk his credit score into the 500s. The mishap taught Michael to check his credit report at least once annually and be mindful of his spending habits, and today his score is in the 700s. You can find more My Money Stories on YouTube.com/CreditKarma. After you’ve discussed your debt and are ready to tackle it, one of the main ways Credit Karma can help is through personalized recommendations based on your credit profile. 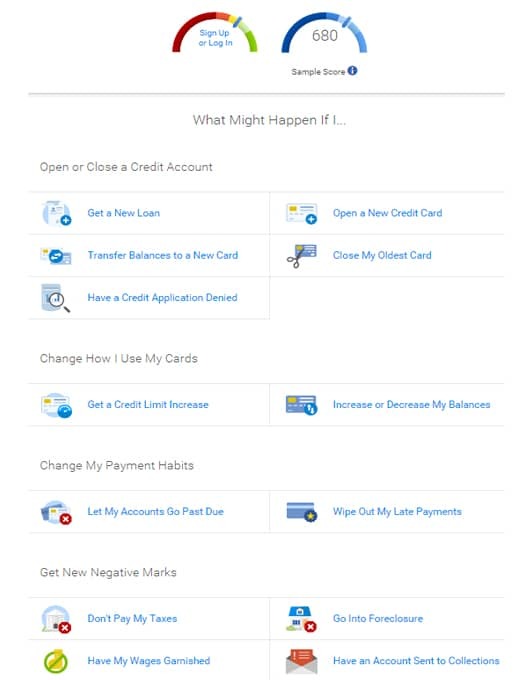 “When you’re logged in, we show you next-step recommendations with tips on how to improve your financial situation, your credit health, as well as financial products you’re best qualified for. We’re able to use the data on 45 million members and past applications to say ‘you would most likely qualify for these products,’” Bethy said. The main benefit of becoming a Credit Karma member is you’ll be provided with your TransUnion and Equifax credit scores and credit reports — all for free and in a context that’s easy to understand. Credit Karma has a suite of financial tools, including a credit score simulator and calculators, that were able to help Viridiana, Jason and Michael, and they can help you, too. The Credit Score Simulator is a nifty tool that can show you how your credit score may be affected by doing certain things like getting a new credit card, taking out a loan, paying off some debt or even letting an account go past due, among many other things. “It’s not a crystal ball obviously, but it can give you a sense of the financial actions you’re considering and how they might affect your credit score. I think that’s useful to see the impact. A lot of times you know that something is going to be negative for your score, but you don’t know how much of an impact it has,” Bethy said. 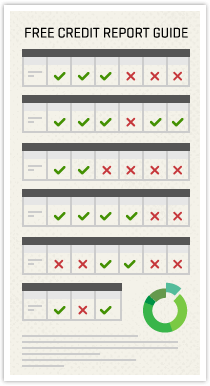 The Credit Score Simulator shows 13 different scenarios and how each one can impact your credit score. Once you sign up and log in, your credit score will appear, and after you quantify the action you’re considering, such as letting an account go past due by one month or getting a new auto loan for $20,000, you can see the estimated score outcome. Fear of the unknown when it comes to people’s credit can really hinder their financial decision-making, Bethy explained, and this tool can be especially beneficial for them. The Credit Score Simulator was also recently updated to use VantageScore 3.0, which is the credit scoring model created by the three major credit bureaus — Equifax, Experian and TransUnion — to ensure you’re getting the most reliable information. 2. Home Affordability Calculator: How Much Home Can I Afford? The Home Affordability Calculator takes into consideration your income, down payment, monthly debt payments and mortgage interest rates to calculate the maximum amount you can afford. Enter your income, down payment, monthly bills and interest rate. It will calculate your estimated home purchase price, down payment percentage, loan amount and monthly payments, as well as details such as insurance and taxes. See the estimated purchase price, down payment percentage, loan amount and monthly payments. If you’re in the market for a new home, this tool can help you immediately figure out how much house you can actually afford before you begin the process of looking. 3. Debt Repayment Calculator: How Long Till I Pay Off My Credit Card? The Debt Repayment Calculator is a useful tool for those who carry a balance on their credit cards because it will tell you how long it will take to pay your credit card off based on your balance, interest rate, expected monthly payment and desired payoff time. time frame, enter the date and see how much your monthly payments need to be to reach your timely goal. The calculator will also generate a pie chart that tells you how much principal versus interest you’ll be paying, as well as a chart that shows you additional balances, rates and payment options. 4. Simple Loan Calculator: What Will My Monthly Payments Be? The Simple Loan Calculator can estimate your monthly payment for different types of loans and is a helpful tool for anyone looking to take out a loan in the near future. Enter the loan amount, interest rate and number of years to estimate your monthly payments. The calculator will generate a chart similar to the Debt Repayment Calculator that shows you additional amounts, rates and year options. 5. Amortization Calculator: How Much of My Payment Goes to Principal? The Amortization Calculator shows you how much of your monthly loan payment goes toward interest, principal and balance over the life of the loan. This is especially useful on large loans such as mortgages. 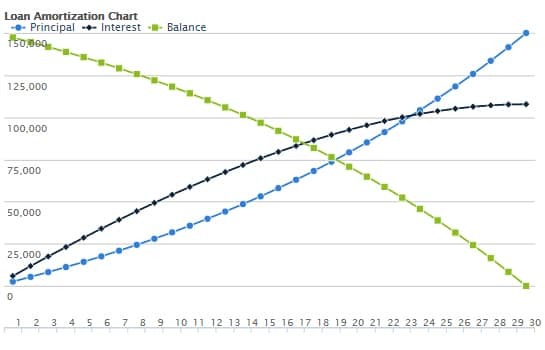 The bottom numbers represent each month of a 30-year mortgage and each line represents how much of each payment goes toward principal and interest. You can see your balance (green) decrease with time. According to Credit Karma, 83 percent of your payments are used to pay down interest in the first year of a 30-year mortgage, versus 3 percent in the final year, and this is why little equity is built in the first few years of a mortgage. Credit Karma was founded in 2008 under the belief that access to free credit reports and scores is a fundamental consumer right. Your credit scores are updated weekly and available online and through the Credit Karma app 24/7. Credit Karma empowers consumers by arming them with the knowledge and tools they need to make better financial decisions. In addition to credit reports, credit scores, calculators and tools, Credit Karma publishes articles and blogs with even more tips and advice, in addition to a community forum where members can get personalized answers to their questions. What began as a tech-startup thriving on its core product of a free credit score is now a community of 45 million members worth an estimated $3.5 billion. Credit Karma continues to evolve and expand its offerings, and through campaigns like “My Money Story”, it hopes to reach more people who need help understanding their credit.